This artist has sketched out life with his girlfriend almost every day for 5 years and they are freaking awesome! Pete Duffield met his girlfriend Kellie Gage 5 years ago and since then embarked on a quest to document their life through his sketches, so that their daughter Poppy. 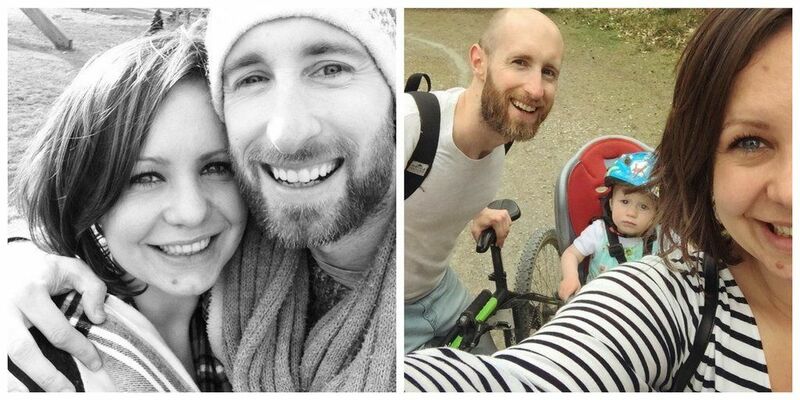 Duffield’s distinctly British sense of humour has garnered fans worldwide-Still, his favourite readers will always be Kellie and their baby girl. “I still make the illustrations for Kellie ― and Poppy now, for when she is older and can look back on them,” he said. We checked out his Instagram Profile and found them cute and hilarious! As far as wedding gift ideas go, we have a gazillion options for products which can be gifted and if nothing else, there is always the envelope filled with money and a coin for shagun. But what Rakesh Vaishnav asked for was something you can never ever imagine. When Rakesh Vaishnav decided to get his two sons, Arun and Alpesh married, he envisioned setting an example which has never been set before. The wedding took place at Ramganjmandi town in Kota Rajasthan. To give you a bit of background, Rakesh lost a family member from complications owing to lack of blood and has since been donating blood regularly. So at his sons weddin, he saw and opportunity and seized it and requested his guests to give him just one gift, that of donating blood. He set up a blood donation camp at the wedding venue. Even the wedding invitations read,”Uphaar ho to aisa, raktdan jaisa” (no better gift than blood donation). While he made it clear to his guests, that in no way should they feel obliged to donate, his efforts inspired so many of his guests to actively participate in a cause that can make a huge difference to the current state of affairs in the country. 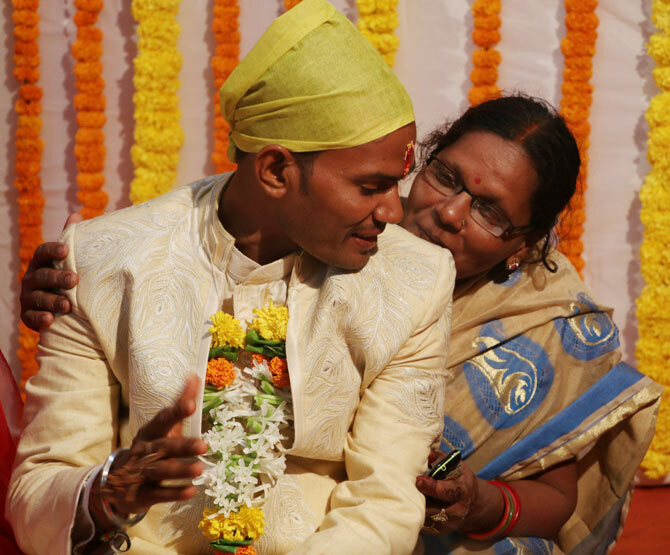 His request did inspire many attendees at the wedding to donate their blood, including his 21-year-old nephew Rahul Vaishnav and guest Saroj Sharma, who at aged 39 donated blood for the very first time. As many as 26 units of blood had been collected in one afternoon, and more was expected to be donated in the evening. 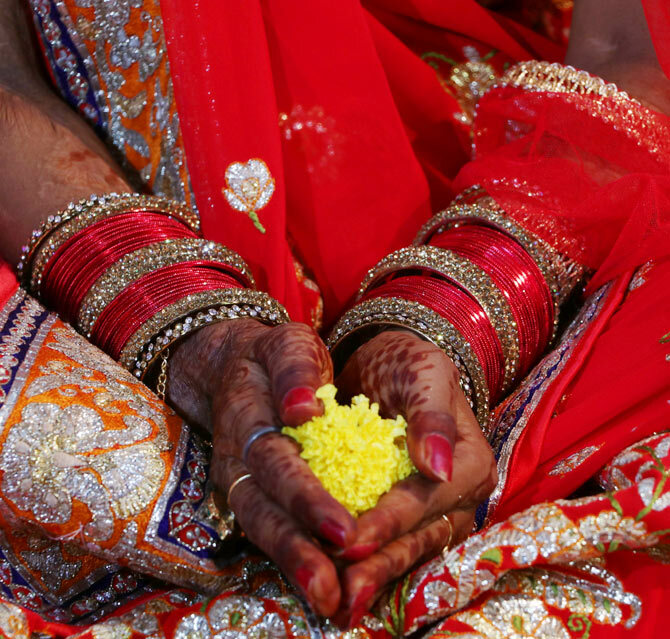 This wedding camp is not Rakesh’s only initiative. He has also worked on awareness campaigns, encouraging others to donate blood and assisting those in need of a donation. “I started a group called ‘Raktdata Jeevandata Samooh’ in 2012. 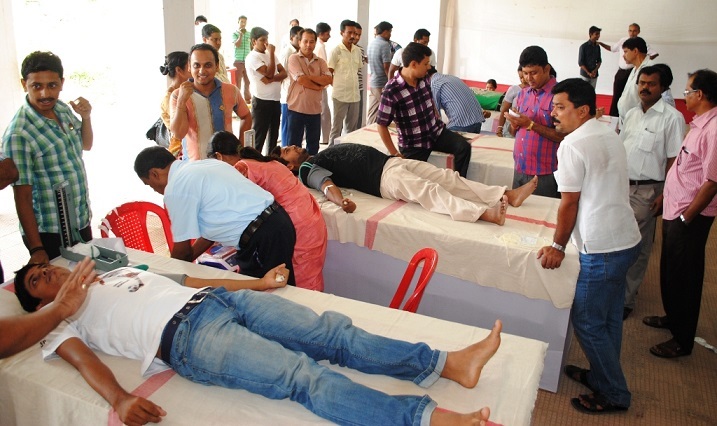 It is connected with voluntary blood donation organizations in nine states and provides blood to the needy people,” he said. All we can say is kudos, we can not draw enough inspiration from you Mr.Rakesh Vaishnav, and it’s such small beautiful gestures by citizens which will make our great country a shining light on the global stage. 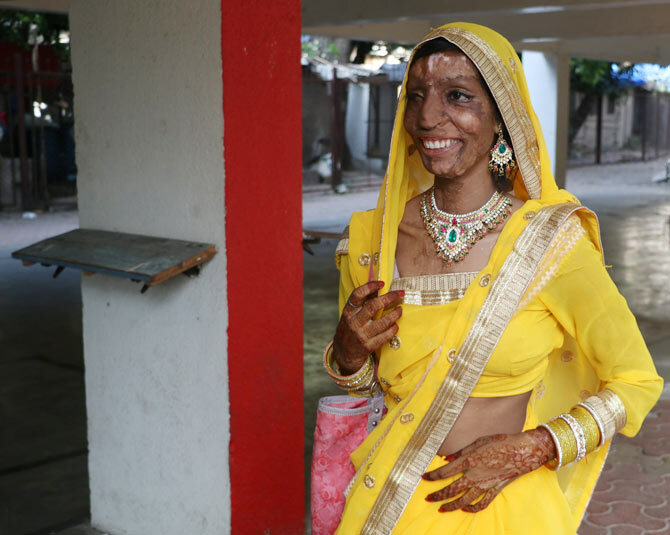 After a petty family dispute, Lalita Bansi was scarred for life when her idiot and scum cousins threw acid on her in their village in Azamgarh, UttarPradesh in 2012. This brave heart did not let this affect her spirit and moved on, undergoing 17 surgeries at Mumbai’s Bombay Hospital and has 12 more to go. As fate would have it, the universe aligned to give Lalita the life she actually deserved after she got a response from a wrong number she had dialled. When the person called back, Lalita had scolded him and he had hung up. He called back 15 days later to explain what had happened and that is when cupid struck! Rahul kumar, a data entry operator from Malad was smitten by how frank a nature Lalita has and proposed to her after a couple of months of phone conversation! That’s when the love story began. “My parents had a love marriage so they didn’t have any problem with my choice,” he adds. After two months of telephonic conversations, Rahul went to Lalita’s house to meet her and as they say, rest is history. 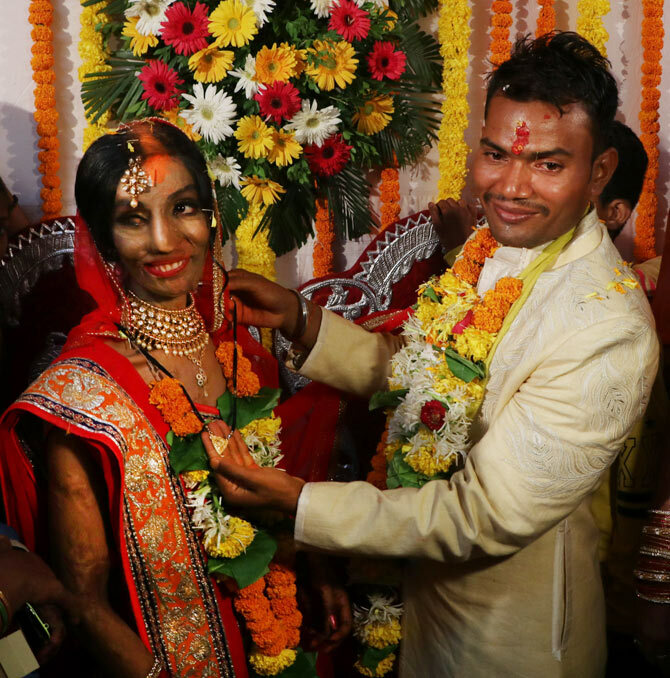 The wedding was held at the D’Silva Technical College in Dadar, central Mumbai, thanks to the efforts of Udyami Maharashtra along with the Acid Survivors Saahas Foundation, who made Lalita’s dream a reality. There was a beautifully decorated mandap, a lavish food spread, celebrities in attendance, and the overwhelming media going click, click at the drop of a hat. Some Photos of their Lovely wedding! Lalita changed into a red bridal outfit and was joined by her make up artist. Despite the chaos around her, not once did the smile vanish from her face. 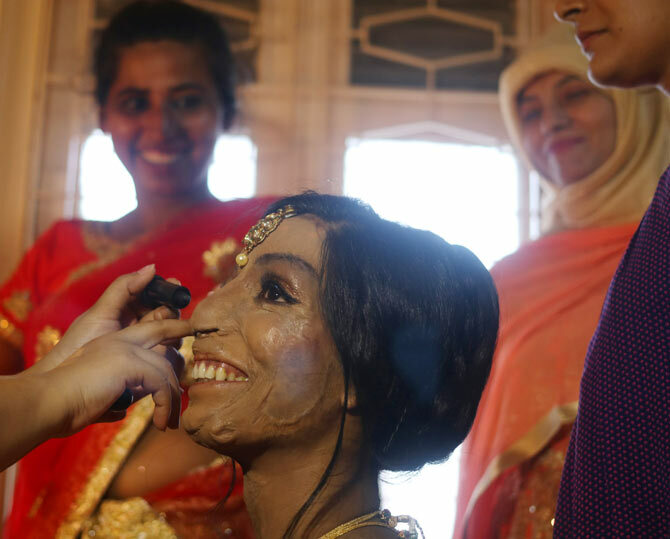 The acid attack survivor had been preparing for this day for a month. Mehendi and lavish jeweller adorned the beautiful bride! We wish them the best life has to offer and a lot more! It takes a special kind of courage to overcome odds in life. Each individual is fighting their own battles and it is only love which brings people together. 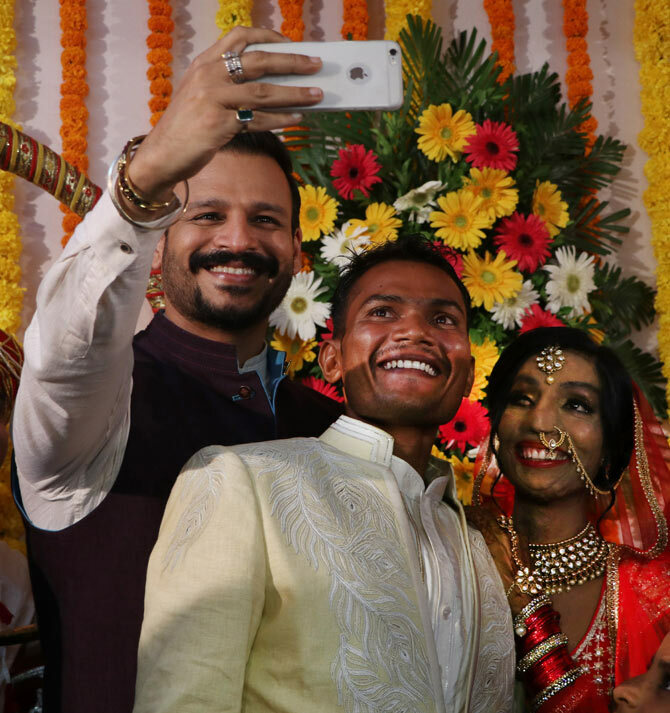 We wish Rahul and Lalita a very happily married life together!